Fall is a great time of the year to re-shingle your roof. - My "Asphalt Shingle Roofing Bid Sheet" is just the ticket for finding the right roofing contractor and from getting soaked! It includes a questionnaire that you provide to roofing contractors to fill out. You then compare their responses with the homeowner tips provided in the other sections of the "Asphalt Shingle Roofing Bid Sheet" to determine who's the best roofing contractor for your project. The "Asphalt Shingle Roofing Bid Sheet" also includes expected costs estimates for the various aspects of the project. Order today and save yourself time, money and most importantly hassles! If you have a frequently wet basement it’s important to solve the problem before you have a bigger problem, mold. Mold growth in the basement can migrate to the upper levels of the home and can be hazardous to its occupants. Even if the wet basement occurs only occasionally, e.g. after a heavy rain storm, mold growth can still be a problem. Also, if you have intentions of ever finishing the basement, it’s a wise idea to resolve the wet basement problem prior to kicking off a basement remodeling project. The best solution for solving a wet basement problem is to dig around the exterior of the home’s foundation and install a perimeter drain. In addition, the exterior foundation walls should be sealed. While at it, it’s also a good idea to install rigid foam insulation against the exterior foundation walls. In addition to installing the perimeter drain also consider installing a sump pump in the basement to remove any water that still may percolate in between the basement slab and the foundation walls. Also, consider installing a dehumidifier to eliminate moisture that can wick through the basement concrete floor. Finally, make sure that the soil grade slopes away from the foundation walls and that all gutter downspouts direct water away from the home. Check out the latest home improvement news in this month's issue of the HomeAdditionPlus.com Newsletter. Its chocked full of home improvement tips and home remodeling advice, as well as a few extras. Also, make sure to check out HouseSight for the latest in homeowner and home remodeling contractor project postings. Over the past few weeks my wife, daughter and I have been slowly renovating my daughter’s room. We’ve added a fresh coat of paint to the walls and most importantly have been painstakingly painting all of the wood stained trim and doors in the room. 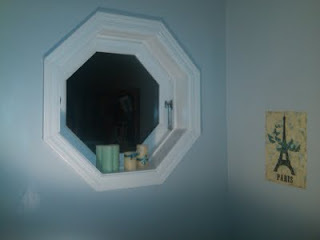 This weekend’s project was painting the octagon window in the room. The octagon window was stained years ago, but it also suffered from some water stains. After removing the octagon window from the window frame we sealed the window with Bin sealer before painting it with two coats of white paint. Reinstalling the octagon window into the window frame was a bit of a challenge. At one point I found myself crawling out the octagon window frame and onto the adjacent roof to pick up a piece of plastic trim that had fallen off the window. Suffice it to say my wife and daughter got a good kick out of seeing me worm through such a tight opening. But, by the end of the afternoon we had reinstalled the window and it was transformed into a thing of beauty.